Sara Fraker joined the Tucson Symphony Orchestra in 2005. 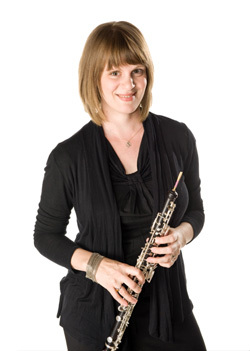 In 2013, she was appointed Assistant Professor of Oboe at the University of Arizona. She spends her summers in residence as a Faculty Artist at the Bay View Music Festival in northern Michigan. Sara has performed at numerous festivals including Tanglewood, Aspen, the Shenandoah Valley Bach Festival, Chautauqua, Spoleto Festival USA, and Schleswig-Holstein in Germany. She has played with the Phoenix Symphony, Arizona Opera, Illinois Symphony, Tucson Pops, Sinfonia da Camera, and Tucson Chamber Artists. Solo appearances with the TSO include Copland’s Quiet City (2012) and Sibelius’ Swan of Tuonela (2013). Sara performs regularly as a member of the Arizona Wind Quintet, faculty ensemble at the University of Arizona. She was also a founding member of the Paloma Winds, which was honored to present a full recital at the 2010 Conference of the International Double Reed Society (IDRS). Dr. Fraker has performed on recital series throughout Southern Arizona, including the St. Andrews Bach Society, Arcosanti, Music From Greer, St. Philips in the Hills, and the Santa Cruz Foundation. Recently, she has been featured as a soloist at the Dove of Peace chamber music series and the 2011 IDRS Conference, where she premiered Jay Vosk’s Lyric Passages for oboe and string trio. Raised in New Haven, Connecticut, Sara is a graduate of the University of Illinois at Urbana-Champaign (DMA), New England Conservatory (MM), and Swarthmore College (BA). Her principal teachers include Robert Botti, John Dee, Mark McEwen, Jonathan Blumenfeld, and John de Lancie. Her doctoral thesis, “The Oboe Works of Isang Yun,” explores twenty solo and chamber pieces by the Korean composer, with a focus on tonal language and relationships to East Asian philosophy. Alex Klein playing solo Bach, Nusrat Fateh Ali Khan, Duffy, Regina Spektor, Sibelius, Tori Amos, Ray Lamontagne. What was your first musical experience as performer or audience member? Hearing my dad play brass quintet and orchestra concerts. I was nine, and I didn’t know anything about oboe reeds. I just loved the sound of the oboe. What is your favorite music to perform? Contemporary chamber music for winds and strings. Swarthmore College, New England Conservatory, and the University of Illinois at Urbana-Champaign. What are your favorite places in Tucson? Downtown during the All Souls Procession, Tohono Chul Park, Yoshimatsu, hiking trails in the Santa Rita Mountains.